Bosma’s article unpacks the newly developed potential for a virtual public sphere and what this means for artistic production and dissemination. The author identifies three specific and unique artistic practices that have developed through the (re)defining of what she refers to as the public domain 2.0. These three artistic practices are; performance involving internet access, artistic platform or social interaction dependent/located on the internet and finally software art. The new media based artistic practices are dependent on collaboration, media access and hands on technologies to perform their intended function as both art and initiators of virtual public space. Bosma identifies some problems with the new public domain of the internet, as described by Kluitenberg. Media access and knowledge of media technologies can be a hinderance to democracy in the public domain 2.0 due to the potential for exclusivity regarding an individual’s access to the necessary, and often expensive, hardware for media access as well as the illusive and ever changing skill set required to navigate the depths of the web. A physical public space, such as those in Toronto, require regulations for accessibility in order to accommodate any potential ‘public’ while a virtual public space does not have such an ethic. While virtual public space provides a place for greater freedom of speech, the ability to disguise or manipulate one’s identity, open access to information, facilitated communication, etc. it can also be a site wrought with disturbing content, hateful speech and inhibited or closed off spaces that are not accessible to their average internet user as opposed to a trained hacker with a much greater knowledge of the potential within internet public space. We can look to Clay Shirky’s article The Political Power of Social Media: Technology, The Public Sphere and Social Change for examples of prohibited access to certain online spaces that are controlled by government forces. Shirky also provides positive examples of how media can be used as a tool to create a public collective both virtually and in a physical space. According to Bosma the three artistic practices of the public domain 2.0 all revolve around connectedness and being connected to others thus I think internet based art may be inherently public. An example of such a virtual public sphere is the online virtual world Second Life which has been employed by a number of artists as a mode of performance and developing social interaction amongst artists and others. I would like to consider two works of art produced or enacted through Second Life. 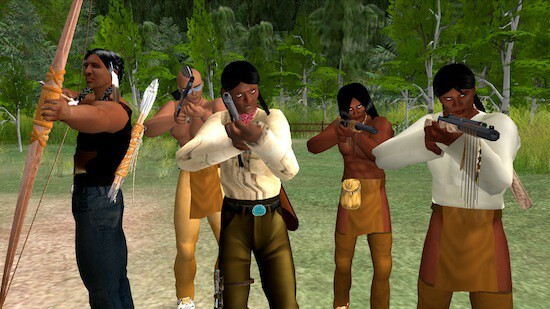 The first is Skawennati’s TimeTraveller™a machinima film shot on Second Life through which the artist and other characters perform through avatars as a commentary on the lack of indigenous presence in contemporary virtual spheres. Skawennati’s performance is both public, in the public domain 2.0, and activist through its commentary and use of web based technologies. The second work is Micha Cárdenas’ Becoming Dragon a mixed reality performance conducted through Second Life. 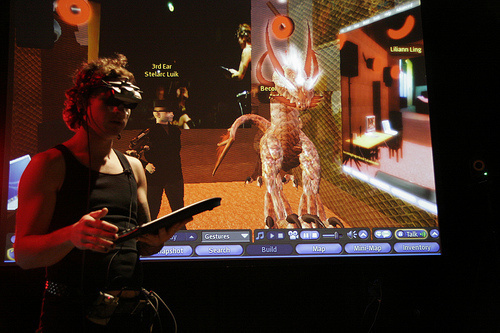 The artist was immersed in virtual reality through a head mounted display that connected her to a virtual dragon avatar. Cárdenas performed as her avatar and interacted with the virtual public for 365 hours as a commentary on the ‘real life experience’ law that requires transgender people to acquire a year of experience living as their identified gender before receiving gender reassignment surgery. Treva – thanks for starting this conversation on virtual public space. You make some interesting connections and I especially like the way you bring in the Shirky article as well as your use of the Second Life examples to expand on the kinds of public spaces that artists have been using and creating online.